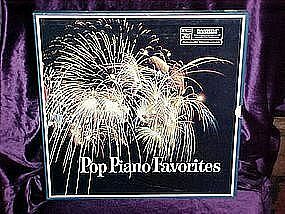 This is a four record set of Pop piano favorites with featured artists Frankie Carle,The Dennis Wilson Quartet,Douglas Gamley and his orchestra,and the happy twins piano quintet. Packaged in a nice double sleeve and each album in an additional paper sleeve. Looks brand new, and never been played condition. Hails from the sensational sixties!